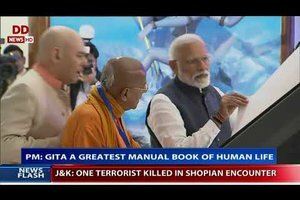 It is not from Gita Press Gorakhpur - Make in India? - Make in Italy! The event took place at the ISKCON Mandir in Delhi. True..but that came about with the western "evangalist" standard operating procedure of active preaching. If it didnt have the western influence it would just be confined to one ashram..one guru who speaks in riddles or worse still the Zen effect of not saying a word. So if ISKCON is succesful is becos they moved away from the introverted approach to religion. ISKCON successfully converted Christ Conscious movement into Krishna Conscious Movement and replaced Bibles with Gita in Most of US Cities and world over using the same way Christians plant Bibles . This tends to show that the message of Gita is universal, made in India is to limiting.